Or view larger version. California's Democratic leaders socialize at a 1959 event promoting Missouri Senator Stuart Symington's nomination as the presidential candidate for the party. May 28, 1959. In this 1959 photograph, a new generation of California's up-and-coming Democratic leaders gathers at a function promoting Missouri Senator Stuart Symington. The senator was building support to campaign for the Democratic presidential nomination in the 1960 election. 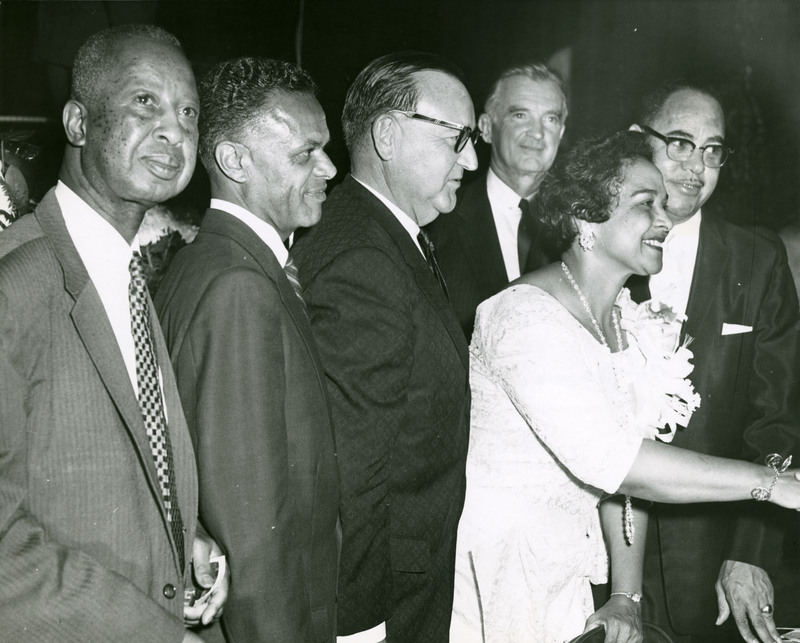 From left to right are: D. G. Gibson; Lionel J. Wilson, who became Oakland's first black mayor in 1977; Edmund "Pat" Brown, California's governor from 1958 to 1966; Senator Symington; Elsie Rumford and her husband, Byron Rumford, Democratic assemblyman from Berkeley who served in the California legislature from 1948 to 1966. Rumford, the first African American from Northern California elected to state government, wrote two of the state's most important civil rights laws---the Fair Employment Practices Act of 1959 and the Rumford Fair Housing Act of 1963.